Wondering when the best time to buy a home is? And the worst time? Well, thanks to data science, we no longer have to guess whether it’s fall and winter, or spring and summer. I’ll save you the suspense: the very best time to buy your dream home is late summer, namely August and September, this according to a new study from real estate listing website Zillow. Apparently prospective home buyers will find the most home inventory and a greater number of price cuts during these temperature-hot months, giving them better odds of finding that perfect home. This means it might be easier to negotiate prices and perhaps even snag a lower price if the property stays on the market for a prolonged period of time. Overall, inventory is off 5.3% from a year ago, meaning you’ll have to buckle your seatbelt and prepare for another tough year if you’re in the market to buy a home, or getting ready to be. Real estate investing is also getting a lot less attractive, and not so easy. Conversely, if you’re a seller, you don’t even have to clean your house, make the bed, or mow your lawn – it’s already sold! Okay, maybe you should do those things to fetch a higher price, but the seemingly endless seller’s market persists. However, there are some house hacks (pardon the awful, awful buzzword) to increase your chances of landing your dream home. 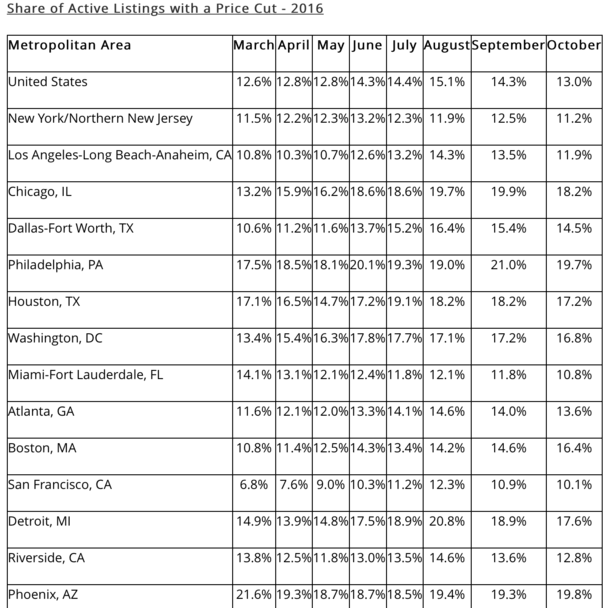 Zillow found out that in most major metros, the month of August featured more for-sale listings than any other month during the year. For example, last year in Los Angeles there were about 8,000 more homes for sale in August than in April. The total number of homes for sale increased from 26,000 to 34,000, a major 31% increase. The same trend was found in many other metros, from Detroit to San Francisco, though not all of them. However, it wasn’t just inventory that improved. Competition also went down in late summer, so even if fewer homes were on the market, there were fewer buyers chasing them. Conventional logic tells us that many would-be buyers want to get situated well before summer ends to ensure they can get their kids enrolled in the new school. They may also be taking family vacations during late summer. It’s also just plain hot in some parts of the country, which might affect buyer traffic and seller motivation, regardless of market conditions. And the potential to negotiate even lower! With more homes and fewer prospective buyers comes price reductions. After all, the business law of supply and demand will dictate a homes price, and if fewer people are chasing more homes, the sales price must down come. Zillow discovered that 15.1% of active real estate listings had a price cut in August, significantly higher than the 12.8% of homes in April. That increases your chances of finding a home on sale, assuming the starting points (listing price) were relatively similar. September was also a good month to find a deal, with 14.3% of homes on sale, so to speak. Of course, this wasn’t the case everywhere, with cities like Ft. Lauderdale seeing pride reductions drop in the six months from March to September. 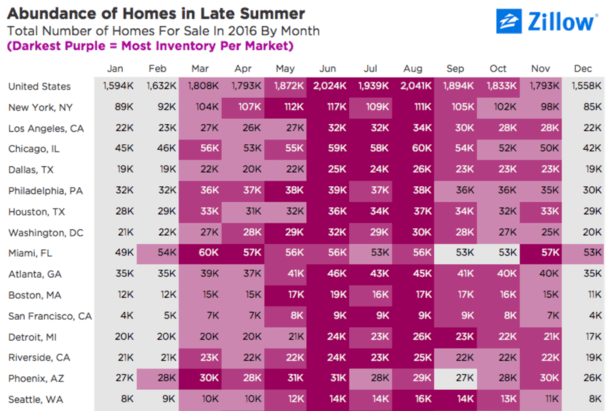 By the way, if you’re wondering when it’s the best time to sell a home, it’s supposedly early May, per Zillow, though Redfin argued winter was the best back in 2013. Of course, for a lot of buyers and sellers, the sale and purchase have to happen concurrently. Like anything else, the best time to buy (or sell) is really dependent on a number of factors that can’t be summed up by one datapoint. The old adage says real estate is local. Today, you can add hyper to the front of local. Real estate markets are different, plain and simple. One neighborhood might be cold with days on market creeping higher and higher while a nearby pocket or street is on fire, with bidding wars the norm. That’s why things like median sales, census bureau data, nationwide home inventory, and what the Federal Reserve is doing might not matter all that much, if at all. Who cares what the median sales price is in Orange County if you live in LA? There’s also the practicality of timing a buy, or even a home sale. Buying and selling isn’t only dictated by price. It’s usually driven by life events, which tend not to happen at the ideal time. Or, “I will sell my house in April.” That might mean you need to buy a home in April too, which could be the worst time because everyone else is out house hunting too. Nope, it takes lots of time and research, touring, open houses, ups and downs, close calls, and more to finally snag that right property, even if it happens to take place in the worst month. Zillow even says the average buyer spends more than four months shopping for a home, and makes at least two offers along the way. I feel like it’s pretty rare to make one offer on one home and have that be the end of the story. Sure, it may depend on the housing market (and the buyer), but nowadays it seems you have to strike out once or twice before getting a hit. Sometimes that could be walking away during the home inspection period, while other times you might get outbid or be unwilling to offer more than someone else looking to buy. Whatever the case, odds are good that the home buying process will take many, many months, if not years. So if you happen to buy in August or September, great! You may have found a property with a price cut. The same might be true even if it drags into the winter months. But telling your significant other that it’s prudent to wait until later this year probably won’t fly. You’ll at least want to get the ball rolling as soon as possible. On top of all this, there’s a good chance Zillow will tell us that the best time to buy is a different month after more data is analyzed next year. So it’s probably best to chalk this one up to interesting, but not words to live by. A smarter move might be focusing on your finances to land a better mortgage rate, which can lower your homeowner costs at any price point. For example, instead of worrying what month it is, or avoiding the worst months to buy, worry about your three credit scores. Make sure they’re all in tip-top shape to avoid unnecessary pricing adjustments on your home loan. Also take the time to shop mortgage rates with different lenders instead of going to one bank, broker, or credit union. And compare loan programs. These two steps alone can make a huge difference in what you pay each month to own your home, no matter the sales price at closing. While you’re at it, choosing the right real estate agent is also key. Find one who knows the art of negotiating to ensure you get a good deal no matter what the month. Some real estate agents are afraid to make lowball offers, while others are willing to take chances when they see opportunities. This is another factor to consider. Along those same lines, it’s important to get pre-approved beforehand and show the sellers you’re a serious candidate. It’s not unheard of to show them you’ve got assets available for a large down payment to get your offer accepted, even if there’s a slightly higher offer already submitted. Lastly, make sure it’s a good time for you personally. Are you ready to become a homeowner? Is now the right time mentally and financially? 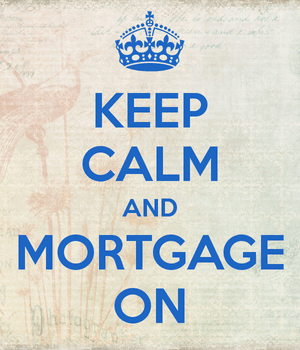 Did you do your research, set aside funds for a down payment and closing costs, learn about mortgages, etc.? Using these common-sense tips, you can get a good deal on a home during any month of the year, even in a red-hot market, and even when it’s supposedly the worst time to buy.